The letters "E" or "U" before the Series letter indicated the type of drive system fitted (see below), whilst numerals after a Series letter showed the bed length. 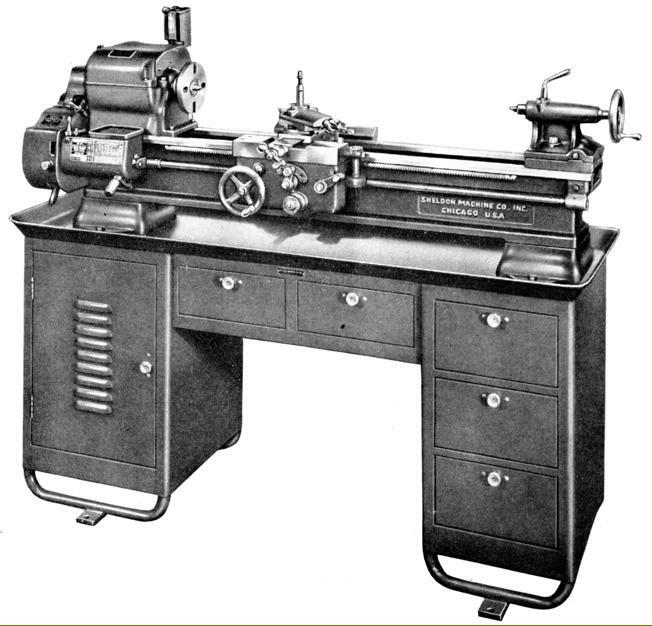 The letters "P" or "B" after the bed length told whether the lathe was mounted on a simple but heavy cast-iron pedestal stand, or a full cabinet with integral chip tray and Q indicated the fitment of a "quick-change" (i.e. Norton-type) screwcutting and feeds gearbox in place of changewheels. Type "W" with a push-button control - this had the luxury of not only a spindle-speed revolution counter on the headstock but also an electric motor, with chain drive, to move the expanding and contacting pulleys of the variable-speed drive. However, one rather odd variant, the Series-M "Walking Stick" (almost certainly a short-lived, early production example) had manual control of the speed change by a T-shaped handle connected to a long rod that caused a jockey pulley to impinge against a pair of V-belts, the resulting motions being able to open and close the variable-speed belt pulleys. 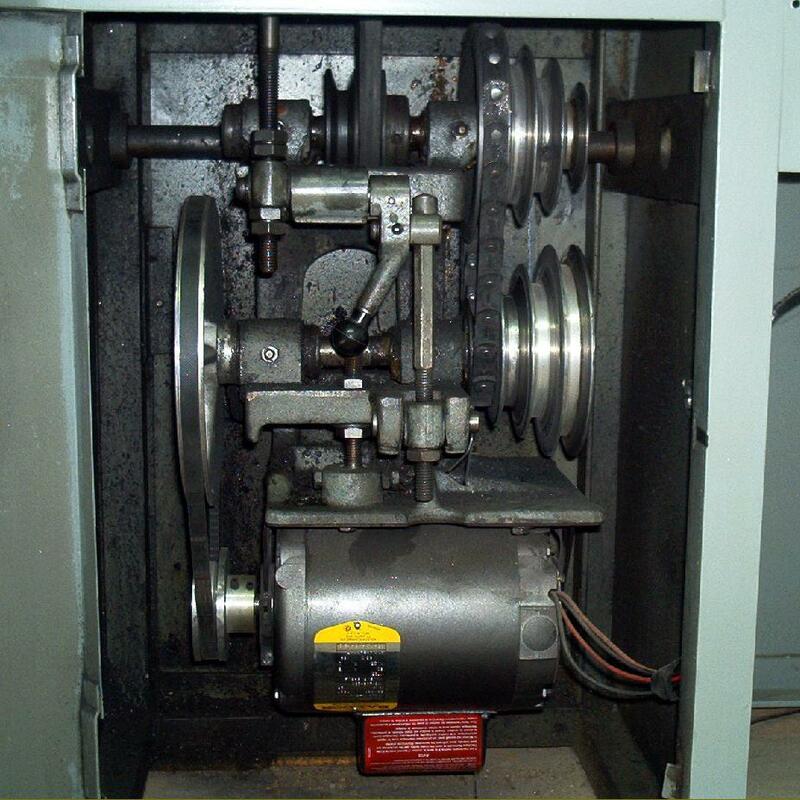 Most under-driven lathes had eight speeds of 50, 90, 120, 215, 290, 510, 690 and 1200 rpm. but others were provided with a slightly different range which could also be ordered as a "two-speed" model giving a total of 16 spindle speeds ranging through: 50, 70, 90, 120, 130, 175, 225, 270, 300, 365, 460, 635, 680, 930, 1185 and 1600 r.p.m. 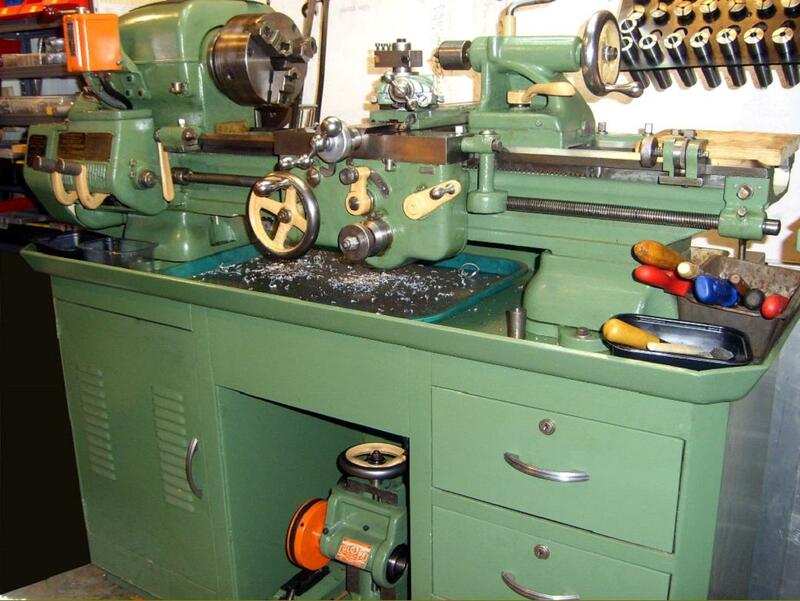 As an example, the lathe Model EM56P was a Series M of 131/8" swing with a 56" long bed fitted with the "E" Type drive system and mounted on a pedestal stand. 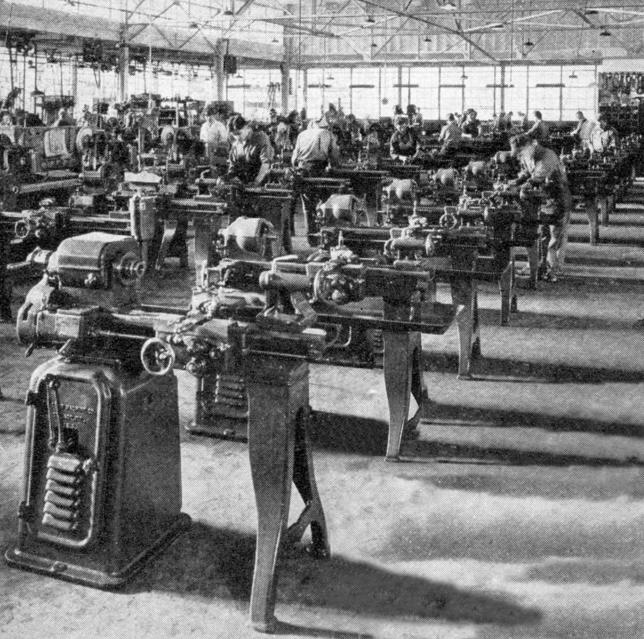 Although a total of sixteen different models of the ordinary engine or centre lathe were offered the factory would build a lathe with any combination of features to special order--a situation that has led to a number of machines being discovered with unusual combinations of features. 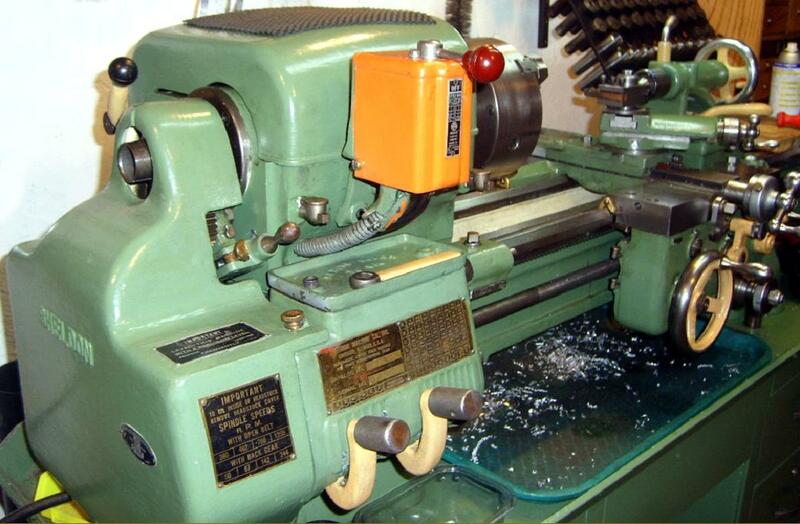 Sheldon serial numbers were consecutive from some time prior to 1938 with the last two digits of the number stamped on the tailstock when multiple lathes were ordered with the same specification - this being to ensure the correct tailstock went with a lathe after painting. 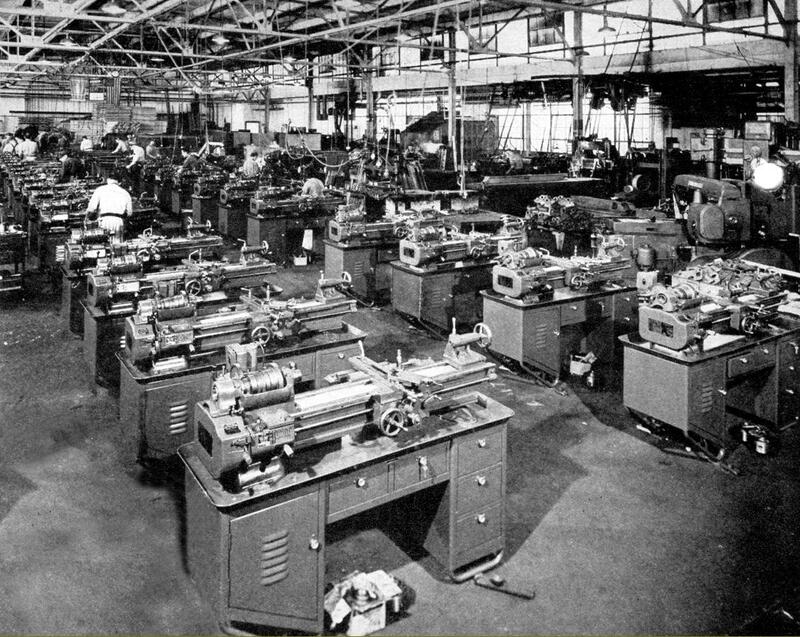 Of traditional "American" pattern, all Sheldon lathes used a bed with V and flat ways and had a general layout - and indeed certain details of some controls - not dissimilar to other contemporary South Bend, Logan and Rockwell Delta machines. Whilst the vast majority of twin-tumbler examples are found with the bed supported on bolt-on, cast-iron box-type feet, early models (and a few of the later type had the tailstock end supported on a large plate formed with a large spring-load "ball" assembly. This arrangement, to allow some degree of self-alignment, or to prevent bed twist if bolted down to other than a flat surface, was also used in a simpler form by some other makers who employed a single bolt passing through a heavy dished washer sitting in a hemi-spherical housing machined in the underside of the foot. All the early models (10", 11" and 12") were available either for bench mounting or fitted to underdrive stands with either the "E" or "U" drive system. Whilst the 10" bench model enjoyed the advantages of a modern eight-speed all-V belt horizontal countershaft unit the 11" and 12" bench lathes had either an integral overhead, flat-belt drive countershaft unit or one of any number of different drive systems, including rather old-fashioned "fast and loose pulley" units designed for bench, wall or ceiling mounting. A special unit was the "Double-Friction Countershaft" which provided, via a crossed belt and two clutches, a mechanical reversing system. By the early 1940s the 10-inch had been engineered to accommodate a neat underdrive countershaft and motor system inside the cabinet stand, though the same model - a version of the robust and popular "single-tumbler" 10-inch - was also available witted with a conventional built-on countershaft as used in earlier years. 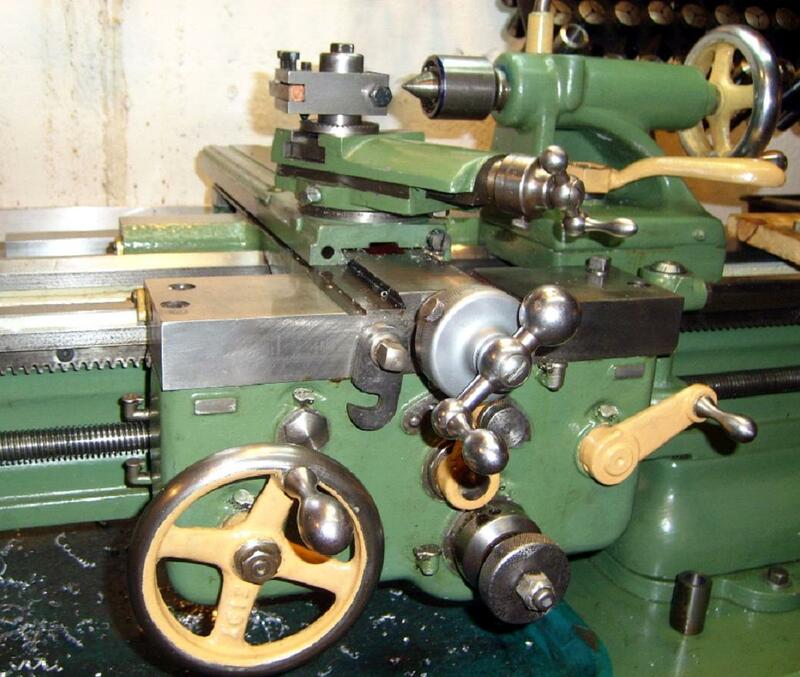 On twin-tumbler gearbox models a choice of three headstock spindles was offered: whilst the Series L had a 11/16" hole through the headstock spindle and a 1.75" diameter, 8 t.p.i spindle thread the Series XL could be ordered with a spindle having a bore of 13/8, a nose diameter of 2.25" with 8 threads per inch - or a much safer and more rigid American long-nose taper in an L00 size. All versions were available in standard and long-bed types, able to take twenty-six and thirty-six inches between centres respectively and could be bench mounted with an integral, horizontal motor-drive unit which, in conjunction with backgear, gave eight speeds of 59, 91, 49, 222, 316, 491, 755 and 1195 rpm. 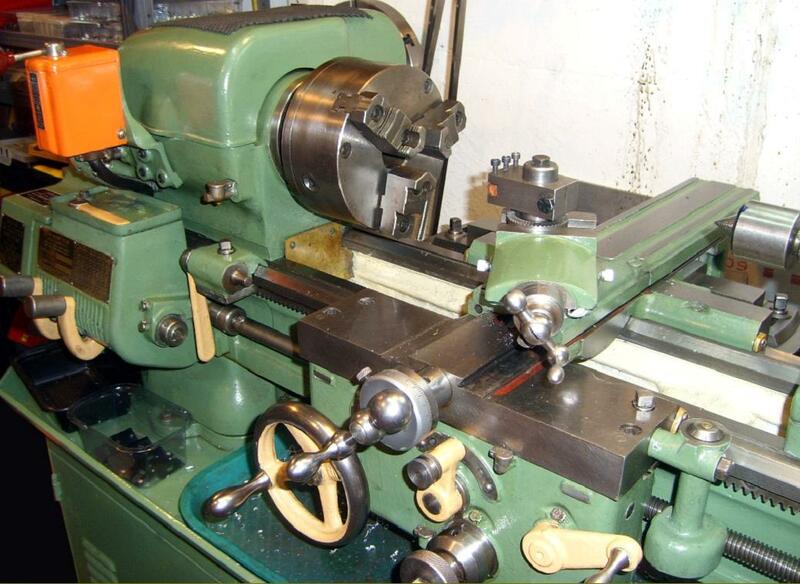 By the early 1960s the maker's were fitting three bed lengths - 38", 46" and 56" - and all machines with fitted as standard with the even more robust and safer D1-4" Cam Lock spindle nose. In line with Rockwell Delta machines of the same size, no separate power shaft was fitted; instead, on all machines fitted with power sliding and surfacing, the feeds were driven by a slotted leadscrew passing through a worm gear within the apron. A quadrant arm on the apron front selected either neutral, sliding or surfacing feeds which were then engaged through a clutch, operated by (depending upon the year of manufacture), either a screw-in knob or toggle lever or at the base of the apron. 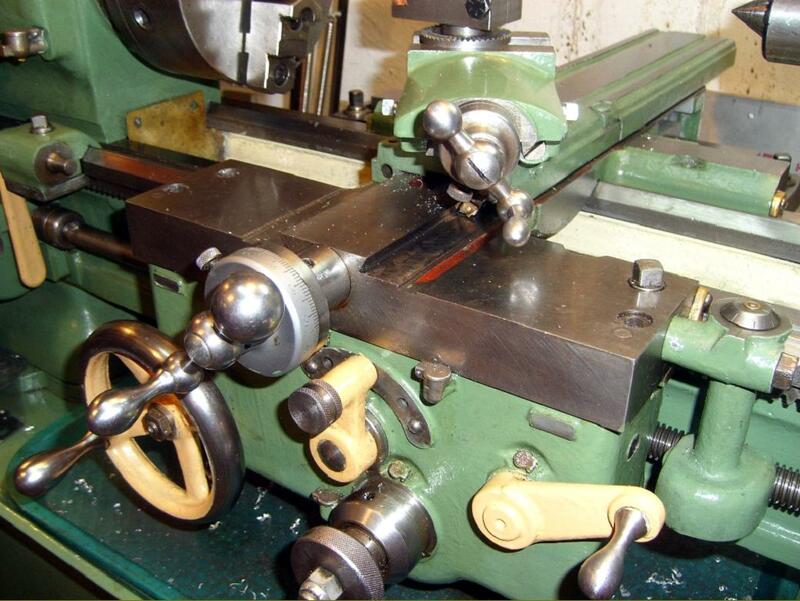 Early lathes, with changewheel screwcutting, were fitted with a useful Harrison-like 3-speed box on the headstock-end of the Acme-threaded leadscrew which provided fine, intermediate and course feeds for each setting of the changewheels. The screwcutting-gearbox shafts, headstock pulley and countershaft spindle all ran in grease-lubricated needle bearings. The large cluster gear was balanced and the cluster gears alternated steel with tufnol; consequently, whether the lathe was running in or out of gear, there was little difference in noise level..
An early 1940s 10-inch "single-tumbler" lathe fitted with a conventional built-on countershaft unit. Left and below: the popular and effective Sheldon underdrive countershaft system as used from the early 1940s. 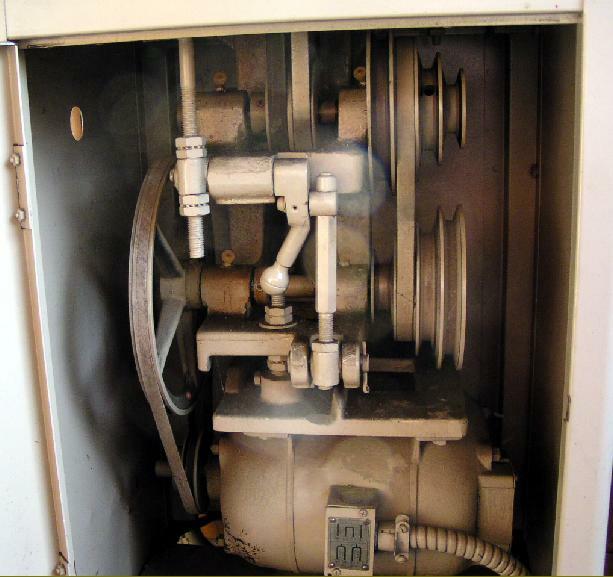 This unit was further developed into the ""E", "U" and "W" drives of the 1950s - the "W" providing a convenient, push-button activated ,electrical-control of a variable-speed system using expanding and contracting pulleys. 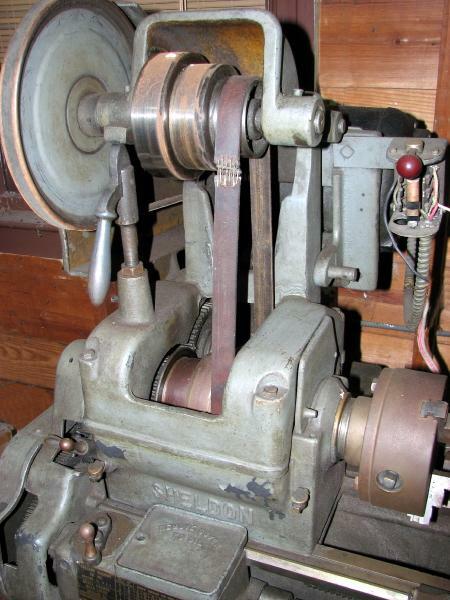 The rear drive 8-speed countershaft unit was only used on 10" versions of late model Sheldon lathes. The E-Drive was a conventional underdrive countershaft assembly designed for the Company's cheaper lathes. With backgear included, either 8 or 16 speeds were available, the latter with a double pulley on the motor and countershaft. 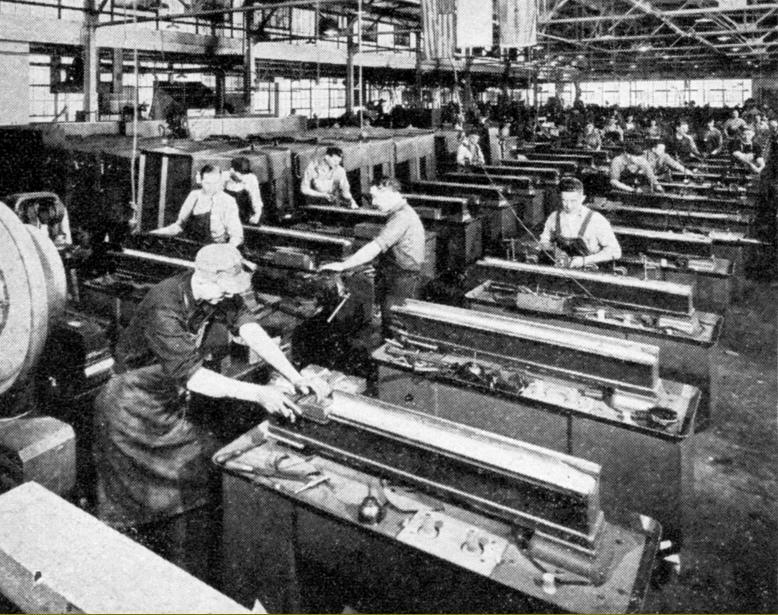 The U-Drive enabled rapid changes of speed to be made whilst the lathe was running. Twin V belts took the drive from electric motor to the 4-speed countershaft unit - with final drive to the headstock by twin V belts. Right: the W-Drive of the 1950s was provided with push-button activated ,electrical-control of the variable-speed belt pulleys. In direct drive speeds ranged form 200 to 2000 rpm and in backgear from 35 to 350 rpm.